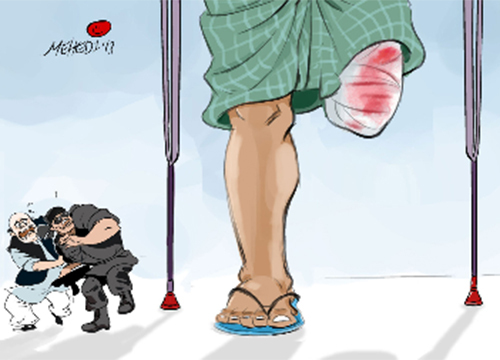 After two years, the government finally decided Tuesday to withdraw the two cases filed by Rapid Action Battalion (RAB) personnel against maimed college student Limon Hossain who hails from Jamaddarhat at Rajapur in Jhalakati. He was shot at by RAB personnel at a place near his house on March 23, 2011, triggering local and international outcry. The battalion on the day filed the two cases with the Rajapur police implicating Limon in an arms case and accusing him of obstructing police duties. The police submitted the charge sheet against him in the arms case on April 24, 2011. The charge sheet in the second case was submitted on July 1, 2011. “The government has decided to withdraw the cases so that the boy could lead a normal life,” said Home Minister Mohiuddin Khan Alamgir while talking to journalists. ‘Shocking’ and ‘irresponsible’ were the two words that came into my mind when I heard the above. ‘Shocking’ , because the honourable minister considered it a show of sympathy to grant Limon ‘freedom’ from cases filed by the all-powerful state. Forget any sense of taking responsibility, the minister did not show the slightest ounce of discomfort or emotion while giving the statement. ‘Irresponsible’, because he just made a nation view him with greater revulsion for dismissing any suggestion of taking action against the thugs in uniform who were responsible for maiming 16 year old Limon. Why? Because the minister didn’t think it was necessary. I simply ask, which tenet of the constitution of Bangladesh was the pathetic excuse for a minister referring to? Does the law in Bangladesh allow for the law being above itself, just because it is the law? I sincerely hope not. Mohiuddin Khan Alamgir, while briefing journalists, made it known that the recommendation made by National Human Rights Commission (NHRC) Chairman Mizanur Rahman was taken into consideration in taking the decision. 1. Defending the government every time another human rights report denouncing state oppression pops up. 2. Remaining silent the rest of the time. One such stand was on the 23rd of June, 2013, when Dr. Mizanur, after getting reappointed by the government, requested Limon to withdraw the case that his mother had filed against law enforcers after he was shot at near his village home in Jhalakati in 2011. During the meeting, Mizanur told Limon and his family that he would approach the home minister again with a proposal to consider withdrawal of the cases the battalion had filed against him. Limon said the NHRC chief had also asked him what actually he wanted and said it would be impossible for him (Limon) to fight against the government. ‘I replied that I want to be rehabilitated and demanded withdrawal of the false case filed against me,’ Limon said. ‘If they [RAB] withdraw their cases, you will also have to withdraw your case,’ Limon quoted NHRC chief as telling him. News agencies subsequently reported that Mizan urged the government to ‘withdraw’ the case against Limon. Despite glowingly acknowledging his role in recommending that Limon be freed, when asked whether the commission would help Limon in the legal fight against the battalion members, the chairman said that the commission had not directly helped anyone in legal proceedings but it would help in the rehabilitation of Limon. ‘The judiciary should deliver its responsibility here,’ he added. Truly a vague response. Few are the words needed to describe the hypocrisy shown by the head of the NHRC in acting as a stooge working for the interests of the government. Human rights are definitely are not safe in the hands of such an entity. Limon's mother, Henoara Begum, filed a case on April 10, 2011, accusing six RAB personnel of attempting to murder, severely injuring and maiming her son. Police on August 14 of last year secretly filed a final report in the case claiming that they found no evidence and witnesses against RAB. Limon’s mother filed a “no confidence” (Naraji) plea against the final report. It was later rejected by the court. Rights body Ain o Salish Kendra, several other organisations and human rights activists have long been assisting Limon in the legal process. There have been outcries and criticisms against the government and the RAB for falsely implicating the teenager, who used to work at a brick kiln to meet his educational expenses. Limon’s counsel Akkas Shikdar, however, found nothing special about the decision on the withdrawal of the cases. ‘We have been saying for long that the false cases have been filed to harass the minor boy and divert the actual incident of human rights violation. We will be happy only when the government will book all the six RAB personnel responsible for the crime and ensure justice to Limon,’ he said.